Crewe Town Council has announced the winners of their ‘Crewe Town Council Mayors Civic Awards’. This dinner event was hosted on Friday 24th March 2017 and we are happy to announce that Supported Community Business (Special Needs) Limited received the ‘Crewe Business Award’. Sponsoring the ‘Crewe Business Award’ was The Glasheen Academy who followed an appeal to the public by Crewe Town Council for nominations. The nominations were for ‘an individual or organisation who has demonstrated initiative and enterprise in business in the Town of Crewe’. Support Community Business (Special Needs) Limited are thrilled to receive the ‘Crewe Business Award’ in recognition of the services they provide. Support Community Business (Special Needs) Limited have thanked everyone who put their name forward, Marilyn Houston (Mayor of Crewe), Crewe Town Council, and The Glasheen Academy. Support Community Business (Special Needs) Limited finished their thank you off with “It is an honour to receive this award, a sense of endorsement for the workshop, and fresh encouragement to continue the work we do in the community of Crewe”. 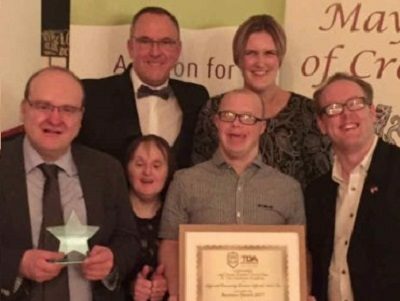 As Support Community Business (Special Needs) Limited are valued customers of ours, this news is outstanding for us and a massive congratulation goes out to Support Community Business (Special Needs) Limited for receiving the award. They well and truly deserve it!